Dogs are allowed on leash in this Nature Reserve. There is a koppie to climb, some trails set out, a river as well as walks among the grasslands. Officially dogs must be on leash, but as the area is huge, it is possible to let your dogs run free. Please ensure they are under your control at all times though as the reserve is full of free roaming wild animals. Recommendation: There is currently major ongoing construction in the park which make it challenging to find the trails as they are not well marked. 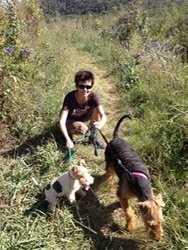 However, the dogs enjoyed the construction work and a visit to the Nature Reserve is recommended. For map with hiking trails click here. For more information visit the City of Tshwane website. Click here.